George Graham Reviews John McCutcheon's "This Fire"
As popular as rock and pop stars can be, many of them will end up having a career that doesn't last very long. If they do keep on going, as many try to do, most will end up on the oldies circuit, or generally fading into obscurity. Jazz and blues musicians, on the other hand, seem to get better with age and typically have careers measured in the decades. Folk musicians can also be counted in the durable category. With the possible exception of some well-known figures from in the 1960s, few dyed-in-wool folkies have ever enjoyed popular stardom, but they can keep on going, maintaining or building their audiences over a good number of years, without really breaking into the popular glare of the commercial media. This week we have a fine example of a veteran folkie who even among some people who are partial toward singer-songwriters, may not be all that well-known, but has been plying his trade for some 35 years and is much respected. 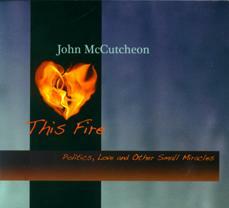 John McCutcheon has just released his thirtieth album called This Fire: Politics, Love and Other Small Miracles. McCutcheon, like many folkies, is a prolific songwriter. Probably his best known song is Christmas in the Trenches, about the spontaneous Christmas armistice that took place during World War I. But McCutcheon is also a writer of children's books, and he is a folksong archivist, having produced over a dozen folklore albums of music by traditional musicians. In other words, McCutcheon is your classic, veteran folksinger and activist. And his new album is a gem, doing everything that a folk-style recording should do, present intelligent, often witty, often political songs in a mostly acoustic setting, in his rich, warm, classic folksinger's vocal style. He sings a couple of love songs, and takes on topics like the death of his own mother, but he lays it on with topical songs like the best of the 1960s folkies, and even does a talking blues in the Woody Guthrie style. But it's not a strictly traditional or rustic-sounding album. He is heard with some tasteful supporting musicians, sometimes with a full band. He co-produced This Fire with John Jennings, a guitarist and keyboard player who has worked extensively in Nashville. They are also occasionally joined by Tim O'Brien, who is a fine singer-songwriter and multi-instrumentalist in his own right. This is a generous fifteen song CD with compositions that date back to 2002, according to McCutcheon's notes. There are a couple of topical songs that arose in connection with the 2004 election, but most of the details are still relevant. But there are also quite a few timeless songs that have things to say, regardless of who is in power. John McCutcheon's new CD This Fire, his thirtieth, is the epitome of what a good folk album should be in this day and age. He brings all the classic ingredients, literate lyrics on topics from love to politics, from poignant to humorous to acerbic, with a tasteful, mostly acoustic backing, and a voice that is the kind of personification of a folk troubadour. There is a fair number of topical song based on news events that will, we can all hope, soon be just a bad memory. But even in his topical songs, McCutchen imparts some timeless wisdom or observations. Sonically, we'll give the CD an A. The sound is warm and very transparent. The acoustic instrumentation is nicely handled, and the dynamic range -- the way the recording maintains the difference between loud and soft passages is respectable. This Fire: Politics, Love and Other Small Miracles is a CD that could well appeal to a couple of generations. First, the Baby Boomer who remember the folk music boom and protest songs of the 1960s, and a younger, now increasingly socially conscious generation some of whom are attracted to acoustic music. It's an outstanding recording that shows that folk music is alive and well in the 21st Century.